Meet Fiddlers' Sons, a traditional P.E.I. 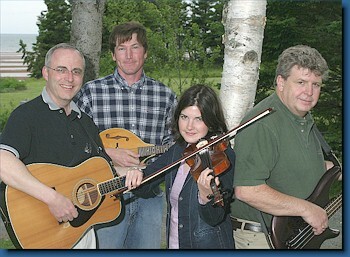 band with a combination of contemporary Celtic and Country music.The Group received the Group of The Year Award in P.E.I. for years 2002 and 2004. The Group Members are: John Webster, Eddy Quinn, Maria McDougall and Garth Matthews. John Webster plays guitar and is the main songwriter for the group. His writing styles and melodies are very unique and is the heart of the group. Eddy Quinn is the lead singer and he also writes for the group. He was voted 2003 Male Artist of the Year by the PEI Music Association. He is also producer and host of a concert series called, Close To The Ground. Maria McDougall does vocals, plays fiddle, flute and whistle for the group. She is only 19, and a very accomplished performer and studies music at the University of PEI. Garth Matthews plays bass, sings harmony and is Manager of the group. He has been involved in music for years, since childhood and has backed up many great Canadian artists such as Michelle Wright and Ron Hynes. 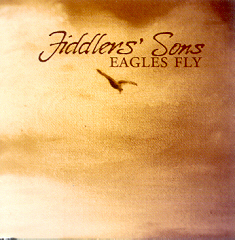 At the PEI Music Awards in November 2004, they won the award for Roots/Traditional Recording of the Year for their Album entitled, Eagles Fly. The album was dedicated to the memory of band member, Alex Websters' son John, who was killed in a tragic farming accident on July 24, 2001. The song is a masterpiece. Their sound reflects the Island Sound, and all group members were born on PEI and their music consists of traditional favourites and foot stomping fiddle tunes. The band has been together for six years with Maria joing the band in 2004, They now have three albums to their credit including; Beaches of Home-Changing Times and their new CD entitled, Eagles Fly. For further information regarding Fiddlers' Sons, refer to their website, address posted above.